Fundamentals of Nursing: Human Health and Function gives students the knowledge, tools, and problem-solving skills they need to tackle real-life challenges in todays fast-paced clinical settings. 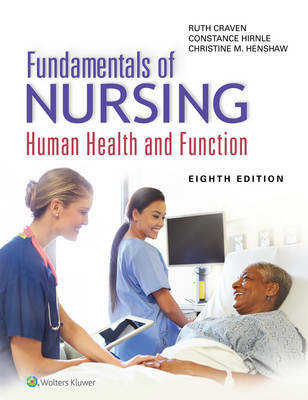 In addition to focusing on basics such as how to promote health, differentiate between normal function and dysfunction, use scientific rationales, and follow the approved nursing process, this practical book goes a step further by providing something just as valuable: an understanding of patient safety, communication, and critical thinking, all of which successful nurses must demonstrate. Features: - A timely new chapterChapter 4, The Nurse's Role in Healthcare Quality and Patient Safetyresponds to multiple imperatives in today's health care, helping students understand systems that promote exceptional care in a complex environment. - Case scenarios that open each chapter show nurses thinking holistically and reflecting on critical thinking questions. - All-new, richly illustrated concept maps, ideal for visual learners, apply the nursing process and critical thinking to the chapter-opening case scenarios. - PICO (patient/problem, intervention, comparison, outcome) displays illustrate examples of a structured, evidence-based way to find answers to clinical questions related to the chapter-opening case scenarios. - Concept Mastery Alerts improve students understanding of potentially confusing topics, as identified by Misconception Alerts in Lippincotts Adaptive Learning Powered by prepU. - Apply Your Critical Thinkingfeatures guide students to explore concepts and situations more deeply. Answers in Appendix B allow students to check their thinking. - Patient Care Plans and Procedures sections (including some newly added procedures) help students transition from the classroom to nursing practice. - NCLEX-style Review Questions prepare students for success on the NCLEX exam. - A robust ancillary package is provided for instructors and students.